Client’s Need: Construction firm needed to promote their proposed hotel project in the village of New Paltz, NY. Our Solution: Develop a marketing campaign that included launching a new website that clearly defined the scope of work and its benefits, organizing informational events to discuss the project with area stakeholders, designing event print materials, and coordinating the printing of a 3D model to be the focal point of the events. We worked with a construction firm that is proposing a hotel/apartments construction project on an undeveloped parcel of land in the village of New Paltz, NY. They needed a marketing strategy to promote the project to stakeholders and the surrounding community. This is a great example where a marketing campaign isn’t just logos and sleek graphic design, but requires a strategy that results in not only in aesthetically pleasing marketing materials, but also engages the audience with informative and relevant data. The beginning of the project was purely fact finding: full scope of the project, history of the undeveloped site, hotel amenities, construction timeline, the number of jobs created, tax benefits, environmental impacts, traffic impacts, etc. With that information, we created a marketing strategy that included launching the new website, designing a new logo, printing a 3-D model of the proposed project, scheduling informational sessions for stakeholders, and designing print materials to be handed out at the info sessions. La Estancia at the Ridgeview is the name of the proposed project. It is named so because La Estancia is Spanish for “the stay” and the hotel/apartment units would have beautiful views of the Shawangunk ridge. The logo was created to allow the organically recognizable silhouette form of the ridge while still evoking the feeling of upscale boutique experience for tourism. From there, the logo design helped drive the overall design and feel of the website. Amenities that include a hotel, a banquet hall, first floor retail space, rooftop restaurant, apartments and a spa. Underground parking that fully maximizes the footprint of the land but also creates enough parking for hotel guests, apartment owners, and for town use. Environmental concerns: recycling rain water, using green technology, and sourcing local workers and materials. Job creation. The project would not only create construction jobs, but also long term part-time and full-time jobs after construction. Finally, we showcased the firm’s previous work to show that they have extensive construction experience, but also that the firm is local. We developed an array of past project work to showcase their abilities and breadth of experience. This was done to put viewers at ease that if the project is approved, the firm would manage the project professionally. The website was never intended to be static, but to change as project progresses. It was developed so the client can easily update the site to reflect results from traffic/environmental studies, changes in the scope of the project, or add additional information. The construction firm held several informational events to present their construction project to area stakeholders. We wanted attendees to leave with “take-aways” with comprehensive information on the construction project. The first series of the print materials? Invitations! First, we had to get attendees through the door. The key to the take-away materials was presenting the information in a concise, but understandable manner. For this project, there was a lot of information and it had to be broken down so that stakeholders could easily understand the benefits of the project. We summarized the information in packets that could be reviewed after the events, but could also be used to help frame their questions during the Q and A portion of the presentation. The print materials were designed both as multi-page packets and as slim double-sided fact sheets. We’re aren’t limited to web and graphic design to promote a client’s marketing campaign. We use an array of innovative marketing materials for our campaigns. For the informational events, there were large architectural drawings of the proposed buildings that were used, but they didn’t truly portray how the hotel would be situated in relation to neighboring buildings or how it wouldn’t affect neighbors’ view of the Shawangunk ridge. 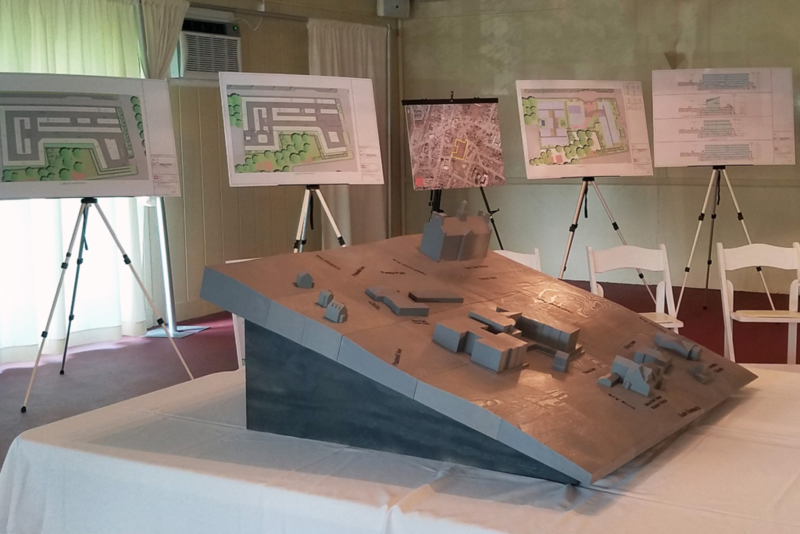 To give a physical representation of the project, we collaborated with the Hudson Valley Advanced Manufacturing Center (HVAMC) at SUNY New Paltz to create a three-dimensional model of the proposed construction project and the surrounding neighborhood. This allowed stakeholders to see how the size of the hotel wouldn’t compromise the sightline for neighbors and how well it would fit within the neighborhood. The key to the 3-D model was making sure the elevations of the landscape, surrounding neighborhood buildings, and the proposed hotel were correct. Topographical survey data was collected for the current neighborhood and the architectural drawings were used for the hotel’s dimensions, resulting in a computer generated 2-dimensional rendering. 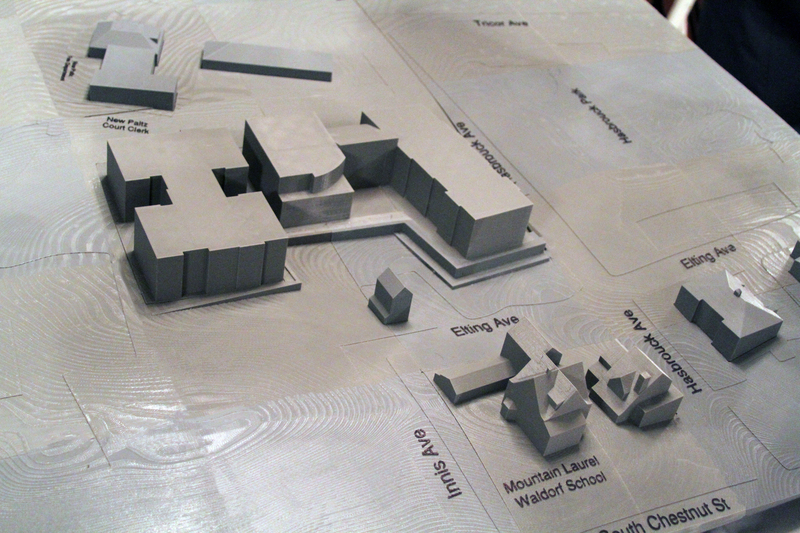 Based on the 2-dimensional rendering, each building was printed individually on MakerBot printers. Print times varied based on the size of the buildings, but because HVAMC has dozens of 3-D printers, the entire printing process only took a few days with printing taking place overnight in some cases. We opted to present an expansive portion of the neighborhood to show how the proposed project would relate to not only immediate neighbors, but with distant neighbors as well. The landscape was printed in four sections to maximum the size of the model. The four sections were attached to one another and the buildings were glued into place, resulting in a 4’ x 4’ model representation of downtown New Paltz. The model became the centerpiece of the informational events, allowing presenters to engage attendees and comprehensively present the project. It allowed attendees to walk around the model and see the proposed hotel from several angles. It helped reiterate that the size of the hotel was not obtrusive and it was not taller than nearby buildings, both possible concerns for neighbors. One key attribute of the model is the hotel was printed in layers so that it could be removed, exposing the underground parking garages. Parking is a huge issue in New Paltz and allowing people to “play” with the model and see the amount of parking was an effective way to clearly showcase a solution to any parking concerns. Model with architectural drawings in the background. Comparing the model to the architectrual drawings. Village of New Paltz captured as a 3-D model. Click on image to see a hands-on evaluation of underground parking. We utilized an array of tools to promote the construction project marketing campaign, each contributing a separate element to the campaign, but consistently promoting our message. The key to this campaign was to use the project information to our advantage and answer questions before they were even asked.